Youth Chorus – The Peoria Area Civic Chorale Youth Chorus is a not-for-profit organization sponsored by the Peoria Area Civic Chorale. Founded in 1986, its purpose is to enrich the lives of musically talented youngsters, providing them with the opportunity to experience a wide variety of musical styles via rehearsals and performances. Preparatory Chorus – The Peoria Area Civic Chorale Preparatory Chorus is a non-auditioned ensemble for 1st-5th grade singers. 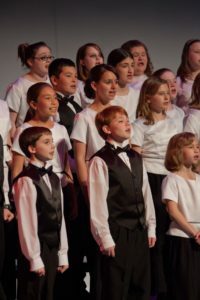 It’s purpose is to help students build basic music skills either to prepare them to join the Youth Chorus ensemble or for their personal musical development. Young Artists Competition – The Peoria Area Civic Chorale actively encourages young singers by sponsoring the an annual Young Artists Competition. Click on the link for more details. Festival Chorus Program – The Peoria Area Civic Chorale sponsors the annual Festival Chorus Program. Made up of talented grade school and junior high school singers from Central Illinois, students are nominated by their choir directors to participate in this exceptional program. 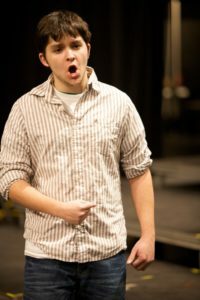 Eureka Summer Choral Camp – Take part in the Eureka College Summer Choral Camp. The Peoria Area Civic Chorale helps sponsor this wonderful event with a scholarship.